Matt Pinfield is the ultimate music fan. He's the guy who knows every song, artist, and musical riff ever recorded, down to the most obscure band's B-side single on its vinyl-only EP import. As a child, music helped Pinfield make sense of the world. Later, Pinfield would approach his music idols after concerts and explain why he loved their music. As an adult, rock music inspired his career, fueled relationships, and, at times, became a life raft. 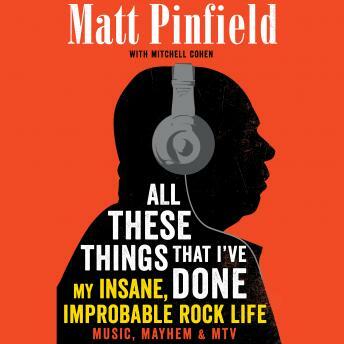 In this expansive memoir, Pinfield traces his lifelong music obsession - from the heavy metal that infused his teenage years, to his first encounters with legends like Lou Reed and The Ramones and how, through his post-MTV years, he played a major role in bringing nineties alt rock mainstream. Over his long career, Pinfield has interviewed everyone from Paul McCartney to Nirvana to Jay-Z, earning the trust and admiration of artists and fans alike. Now, for the first time, he shares his five decades of stories from the front lines of rock and roll, exploring how, with nothing more than passion and moxy, he became a sought-after reporter, unlikely celebrity, and the last word in popular music.